Since 2012, the demand for physician assistants has more than tripled. The demand for physician assistants has increased by more than 300% since 2012, a figure that reflects the profession’s status as the number one job in the United States. To honor the growing impact of PAs on the healthcare system, the American Academy of Physician Assistants is celebrating National PA Week from October 6 to 12. Demand for PAs continues to grow. The Bureau of Labor Statistics predicts that employment of PAs will grow 38% by 2022, a rate that is much faster than average employment growth rates. The Bureau credits this to a number of factors, including the aging U.S. population, an increasing number of people who have access to healthcare, and the cost-effectiveness of PAs compared with physicians. Many health care organizations have looked to PAs to fill a gap in primary care as more physicians retire or move to other medical specialties. In addition, PAs are an important resource to help ensure that people who are newly insured under federal healthcare reform receive the care they need. In addition to increasing demand, PAs have also seen an increase in average salaries. According to results from the 2015 AAPA Salary Survey, the median base salary for PAs increased from $90,000 in 2012 to $93,800 in 2014. In addition to this base salary, the survey found that 54% of PAs received monetary bonuses, and more than 75% received some other form of compensation, including research stipends, profit sharing, student loan repayment, paid relocation, tuition reimbursement, or signing bonuses. For more information on National PA Week, visit www.AAPA.org/paweek. 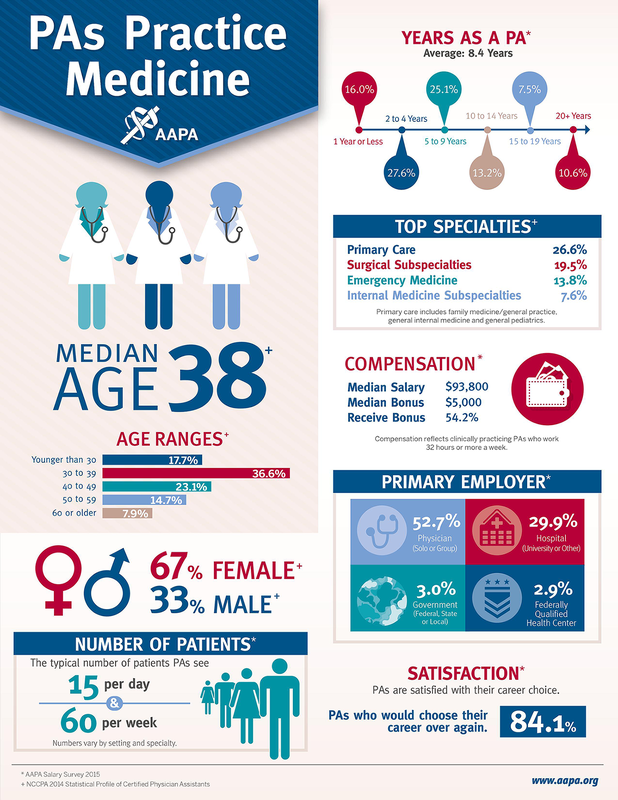 For more information on the 2015 AAPA Salary Report, visit https://www.aapa.org/research/salary-report/.